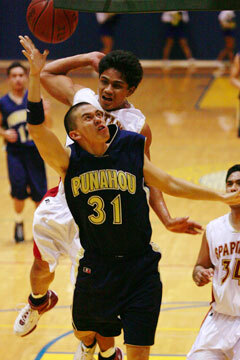 Ted Hawkins of Punahou drove to the hoop against Maryknoll's Jordan Ho-Ching last night. Maryknoll gave Punahou everything it had for three quarters. In the end, though, it wasn't enough against the top-ranked Buffanblu. After a 32-all game at halftime and holding a tenuous four-point lead at the end of the third quarter, Punahou responded by outscoring the Spartans 18-8 in a decisive fourth quarter to win 72-58 at Hemmeter Fieldhouse and remain undefeated (5-0) in the Interscholastic League of Honolulu. Maryknoll fell to 1-4. "We really needed to exert ourselves in order to play well," said Maryknoll coach Blaine Gier. "We did that for three quarters, played really well, but when it came to the fourth quarter, we just didn't have enough. Playing the best team in the state, you're going to have to play at a higher level. We tried to do that." Spartans turnovers and big plays from Punahou guard Miah Ostrowski and center Spencer McLachlin down the stretch widened the team's lead to as many as 17 points, a gap not indicative of the competitive nature of the game. "They challenged us and went after us, and my hat's off to them," Punahou coach Dan Hale said. "Fortunately for us, we rose up to that and kept things to what we were doing well, and kept the defensive pressure up. That was a tough team, boy, they showed a lot." Ostrowski finished with 24 points and McLachlin 20, the latter despite sitting out large chunks of the game with foul trouble. Maryknoll's Jordan Ho-Ching led all scorers with an ILH career-high 30 points and kept his team in position to upset the Buffanblu most of the way. But besides guard Travis Liu (10 points), no other Spartan reached double figures. In the first quarter, Ho-Ching and the other Spartans attacked the basket with abandon, and drew two fouls on 6-foot-6 center McLachlin. The senior was forced to watch the entire second quarter from the bench, something he hasn't had to do all season. "It was tough 'cause I'm not the type of player that gets in foul trouble very often," McLachlin said. "Coach was telling us, 'We believe in everyone on this team, anyone can do it.' He probably could have forced me in, but he wanted the other guys to do it. After he told me that (explanation) I was fine." With McLachlin out, Ho-Ching slashed to the basket time after time, drawing fouls and hitting an assortment of short jumpers and layups. He scored his team's final six points before halftime to put the Spartans up 32-29, for the last of his 19 first-half points. Ho-Ching was quick to credit his teammates for helping him have a big game. "We're coming into this game thinking there's nothing to lose, and thinking this was just another team," Ho-Ching said. "My focus was to get us playing as a team." Ostrowski had other ideas. With about 5 seconds to play in the half, the senior guard brought the ball up, crossed over to his left and hit a 23-foot 3-pointer over a double-team just before the halftime buzzer to knot things up. The Spartans came out just as energized in the second half. Consecutive baskets by center Ross Lum extended Maryknoll's lead to 44-36 in the middle of the third quarter, and the entire Spartan bench and rooting section erupted. On the next play, McLachlin was called for a charge, his third foul, but it just seemed to fire him up. On the next Buffanblu possession, he stepped out for a 3-pointer, and Ostrowski followed with a long ball and a layup to tie the game at 46. The Buffanblu defense picked up as well, forcing back-to-back turnovers and eight more unanswered points. Two baskets by Ho-Ching and Lum at the end of the third quarter fueled the Spartans' hopes for an upset. But Punahou came out with a vengeance to start the fourth, going on runs of 8-0 and 7-0 to extinguish any chance of a letdown. Ostrowski played like a man possessed, crossing over defenders and driving hard to the basket for nine of his points in the quarter. Maryknoll committed three key turnovers during that span and hit just one 3-pointer in the final minutes. "We were fortunate tonight, definitely," a relieved Hale said. MARYKNOLL--Rian Huizingh 0, Reyn Higa 3, Garrick Chock 3, Travis Liu 10, Jordan Ho-Ching 30, Richard Herring 0, Jordan Napoleon 4, Ross Lum 8. PUNAHOU--Miah Ostrowski 24, Kimo Makaula 4, Dane Okamura 0, Kyle Whitford 1, Dalton Hilliard 7, Henry Cassiday 2, Ted Hawkins 0, Sean McFadden 0, Trevor Crabb 0, Kameron Steinhoff 14, Spencer McLachlin 20. 3-point goals -- Maryknoll 4 (Higa, Chock, Liu, Ho-Ching), Punahou 4(Ostrowski 2, McLachlin 2). The Raiders bench outscored the Owls bench 22-4, and Pablo Warner poured in 15 points to aid in the Iolani victory. IOLANI--Kela Marciel 11, Andrew Skalman 0, Nick Christman 2, Ryan Dung 6, Case Miyahira 1, Taylor Mounts 2, Liloa Nobriga 17, Lionel Fujioka 4, Berton Wong 1, Brandon Ball 0, Bricen McCartney 0, Pablo Warner 15. MID-PACIFIC--Ryan Kurihara 2, Sampson Won 0, Marcus Holyfield 14, Jaime Rivera 0, Jarryd Yasui 0, Kellar Ellsworth 14, Devon Takenaka 9, Josh Grant 4, Bryson Beirne 0. 3-point goals -- Iolani 0, Mid-Pacific 0. Rykin Enos scored a game-high 18 points to help lead the Warriors over the winless Monarchs. KAMEHAMEHA--Randy Cummings 11, Kawika Lyons 0, Mitchell Kauweloa 2, Andrew Godinet 5, Pono Hanson 10, Rykin Enos 18, Jan Kauka 0, Levi Goeas 0, Auwae Derego 3, Pii Minns 2, Conrad Scheidt 3, Kamakoa Downey-Jovanovich 0. DAMIEN--Nikko Romuar 7, Mitchel Cabreros 0, Anthony Tuitele 15, Chris Cross 0, Aminis Thompson 9, Austin Dawson 3, Kaiakoili Lima 10, Kenneth Rossi Jr. 0, Haku Correa 2, Christian Vasconcellos 6. 3-point goals -- Kamehameha 5 (Cummings 3, Godinet, Enos), Damien 9 (Tuitele 5, Lima 2, Dawson, Romuar). Leading scorers-- AOP: Keoni Daniel 22. Asts: Nick Castello 13. Kam: Kai Rilliet 13. StL: Kyle Leong 6. CA: Jason Ko 34. RA: Joshua Barros 18. Pun: Max Halvorson 13. Han: P.J. Wood 14. UHS: Noah Chong-Viernes 15. WOL: Liko Satele 9. HBA: Reid Morihara 14. LB: Keawe Ochman 16. Scott Keiter-Charles scored a game-high 22 points as the Knights edged the Red Raiders for their first win. Willie Ching led Kahuku with 18 points. KAHUKU--Nehoa Akina 0, Pele Soliai 12, Jack Damuni 6, Irwin Ah-Hoy 5, Ian Fujinaga 1, Onosai Wong 4, Alema Tachibana 0, Willie Ching 18, Pat Au 9, Jray Galeai 4. CASTLE--Bronson Kekahuna 0, Nickolas Tuamoheloa 5, Layne Kihara 4, Scott Keiter-Charles 22, Keanu Bruhn-Nakihei 10, Micah Clore 5, Malani Lum 8, Shayne Carvalho 2, Kyle Kia 7. 3-point goals -- Kahuku 3 (Soliai 2, Ching), Castle 4 (Keiter-Charles 2, Tuamoheloa, Lum). Daniel Arruda scored 12 points as the Rough Riders upset the Bulldogs. Jason Nutter scored on a bank shot with 7 seconds remaining to give Roosevelt the lead, and Arruda added two free throws for the final margin. Keone Reyes led Kaimuki with 15 points. KAIMUKI--Daniel Colon 7, Chezz Ramos-Dias 0, Brandon Madamba 3, Bryan Lim 0, Makalii Nahinu 2, Ryan Kakitani 9, Keone Reyes 15, Beau Albrechtson 7. ROOSEVELT--Jason Nutter 7, Lowen Kahooilihala 0, Matt Kualii Moe 6, Daniel Arruda 12, Kenese Ola 4, Darren Erickson 10, Jeremy Harvest 7. 3-point goals -- Kaimuki 6 (Kakitani 3, Colon, Madamba, Reyes), Roosevelt 5 (Moe 2, Nutter, Arruda, Harvest). Donovan Olmos scored 14 points, including three 3-pointers, as the Trojans defeated the Chargers to remain undefeated. MILILANI--Devon Castellano 0, Jordan Torres 5, Curtis Murakami 9, Kendrick Clarke 3, Fred Nillo 3, Donovan Olmos 14, Warren Duke 2, David Otte 4, Brandon Dela Cruz 3, Jonathan Keen 7. PEARL CITY--Kellen Oshiro 8, Skye Kaapuni 5, John Giran 0, Troy Antoque 9, Lawrence Acasia 4, Ryne Calbero 4, Allan Agni 0, Antoin Dewalt 0, Anthony Ferretti 4, Scott Braceras 0, Jahron Castillo 0. 3-point goals -- Mililani 5 (Olmos 3, Nillo, Murakami), Pearl City 3 (Oshiro 2, Antoque). Gary Satterwhite scored 19 points as the Rams beat the Mules. RADFORD--Jonathan Combis 2, Travis Daniels 6, Justin Lord 10, Mario De Los Santos-Gonzalez 0, Stevie Williams 0, Matt Hoover 8, Jared Brown 6, Matt Alofaituli 4, Aldrin Valdez 0, Soosoo Tauleilei 13, Gary Satterwhite 19, Antonio Williams 9. LEILEHUA--Dustin Pau'u 17, Tyler Togashi 0, Kolwin Dixon 12, Paul Williams 0, James Samuel 1, Tavana Alailima 0, Corey Morgan 0, Josh Brooks 15, Art Laurel 15, Afe Talaeai 1. 3-point goals -- Radford 4 (Hoover 2, Tauleilei, Satterwhite ), Leilehua 5(Pa'u 2, Laurel 2, Brooks). Rey Bartian scored 19 points and Glenn Ernest added 14 to lead the Governors past the Bulldogs. WAIALUA--Edwin Rubio 7, Matthew Manalo 7, Isiah Ramirez 4, Marnick Dela Cruz 0, Bernard Menor 0, Enoch Zawadj 1, Marc Nacapuy 14, Cassidy Klinefelter 0, Brian Graziano 16, Aaron Lapitan 2, Tauese Tapusoa 2, Caleb Fore 5. FARRINGTON--Jordan Ibana 2, Christian Hernandez 12, Dio Labayog 0, Oscar Carter 2, Steven Kamano 0, Bryson Tatupu-Leopoldo 8, Elijah Lesu 6, Ziggy Muramoto 0, Charles Rocha 0, Joshua Wallace 0, Rey Bartian 19, Glenn Ernest 14. 3-point goals -- Waialua 2 (Manalo, Ramirez ), Farrington 1 (Hernandez). Obie Woods scored a game-high 23 points as Na Alii defeated the Marauders. Robert Donley led Waipahu with 20 points. WAIPAHU--Tyler Martin 5, Jasper Leano 5, Andrew Petello 0, Robert Donley 20, Randy Agustin 3, Mike Pascablo 0, Jarron Vallente 0, Christian Dadulla 14, Dexter Cabrabilla 18, Regan Prestidge 2, Jordan Morales 0, Ryan Komatsu 0. AIEA--Lofa Liilii 19, David Sevaaetasi 4, Ryan Mora 1, Jarred McKee 0, Alan Fonoti 2, Josh Chung 18, Eric James 8, Keenan Naeole 0, James Buchanan 5, Aldodius Colquitt 0, Obie Woods 23. 3-point goals -- Waipahu 3 (Martin, Agustin, Dadulla ), Aiea 8 (Chung 4, Woods 2, James 2).